Professor Cedric Johnson extended his argument from his prize-winning essay "The Panthers Can't Save Us Now"
Addressing a historic discussion about the tensions between race and class for socialist strategy, Johnson argued against the legacy of racial essentialism in contemporary political movements, and for a class analysis rooted in a materialist understanding of Black political life. Cedric was asked if he would be willing to extend his argument for New Politics and he graciously agreed to do so. Three scholars and activists (Jay Arena, Touré Reed, and Mia White) commented on the significant political issues he has raised. Professor and Department Head Morning Shift digs into the company’s legacy and cultural Jane Rhodes joined WBEZ’s “Morning Shift” to discuss the impact. legacy and cultural impact of Johnson Publishing in the wake of the company’s bankruptcy filing. 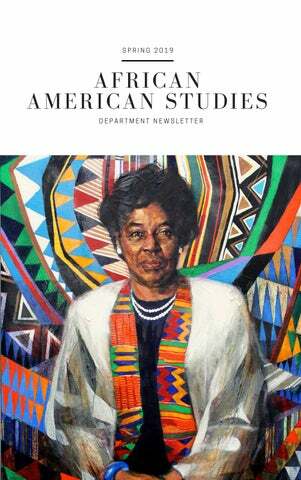 The Chicago-based publishing house behind Ebony and Jet magazines has been hailed as one of the most successful and influential blackowned corporations in the U.S.
Introduction to approaches, methods, and key debates in the study of black culture in a transnational and diasporic context. This course will introduce students to the history of policing in Chicago, from the Haymarket affair through the Burge torture scandal, with attention to links between local police and federal law enforcement agencies. It will also address a range of recent and ongoing debates, including the death of Laquan McDonald, the trial of Jason Van Dyke, and questions about civilian oversight, expanded sanctuary, the gang database, surveillance in schools, social media monitoring, and the new police academy. Alum Justina Anigbo and Tierra Bradford shared their experiences and how their studies have helped them in their careers. The Grace Holt Award winners Amanda McDonald and Lacreshia Brits received their awards at the Grace Holt Luncheon. GRACE HOLT AWARDEES & ALUMNI Grace Holt Award winner Lacreshia Brits accepts her award and future research. Grace Holt Award winner Amanda McDonald accepts her award and discuss her research project. Alumni Justina Anigbo talks about her experience as an AAST student and career path at Indiana University School of Dentistry. Alumni Tierra Bradford explains her current work at Accion and how her studies as an AAST student have helped her. RESEARCH SPOTLIGHT: AMANDA MCDONALD AAST and Sociology major Amanda McDonald discusses her research surrounding black students and the university. What are the particular challenges they face? What are some insights from students, faculty, and staff? After endless committees, task forces, and other efforts, what is holding back real change? What aspect of your research are you most excited to share? I am most excited to share the dialogue between students, staff, and faculty (people invested in the success of Black students on this campus). I haven’t observed or heard of a space like a community forum that is centered around the experiences of Black students, so I am excited to share my research to possibly get the conversation started. What led you to do this research? And what influenced your approach to the research? Upon leaving a private, all-women’s, Catholic university in Minnesota, I realized that university was unsuitable for me because not only was I uninspired by what I was learning, but I felt isolated because there was such a small population of Black people at the university. When I got to UIC, I assumed that feeling would have disappeared, but it hadn’t. I had very few friends and I did have a place where I felt like I fit in and I wanted to see if others felt that way or how they navigated this space to feel more included. Understanding that various agents exist within the workings of a university influenced my approach because I wanted to interview those who interacted with Black students, those who made decisions for Black students, and Black student themselves. Where do you see this research taking you in the future? How has it inspired you? I see this research aiding me in choosing grad schools and graduate programs. While I am studying the undergraduate population, I’ve noticed, even here, that a lack of representation is prevalent for grad students too. Some Black undergrads have never had a Black TA, for example. I don’t want to have the same undergraduate experience where I feel like one of a few Black people in my program. This research has inspired me to dream wildly, though. It was very refreshing to see so many staff, faculty, and students, alike invested in Black student success. This research also inspired me to be proud of myself while I juggled so many responsibilities and managed my time efficiently. What have you taken away from this research project? With this research, I learned that history matters much more than what I presumed it did. Also, I learned that institutions can be modified to uplift and sustain populations that it originally oppressed. I also learned about some of the various intricacies that make up a university. There’s so many departments, offices, and committees geared towards student success. How did you prepare for your presentation? Aside from pestering Professor Rhodes and Bri Hanny about the presentation aesthetics and my slides, I happened to be listening to Drake and Future’s “What a Time to Be Alive” album to pump me up and “Big Rings” came on which inspired me to have reparations and equity on my mind. What was challenging about your research and how did you deal with it? There were so many beautiful challenges with my research. One for example was time. I balanced four classes, my independent research, working, and commuting to campus every day. Ironically, another challenge was finding and my outreach to Black students. 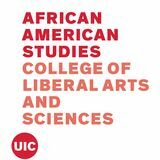 What would you say (or advice would you give) to other AAST students considering pursuing research at UIC? If you are a student in AAST and you want to do your own research: Do It! Don’t worry about being told no. And don’t let a “no” stop you. In our field, we learn about people being told, “no” all the time. Don’t let that deter you. Undergrad, can be one of the few times where you have the freedom to experiment with your interests, so I would encourage you to explore them. Also, there’s so many faculty here, in this department, rooting for you and that want to encourage your scholarly exploration.